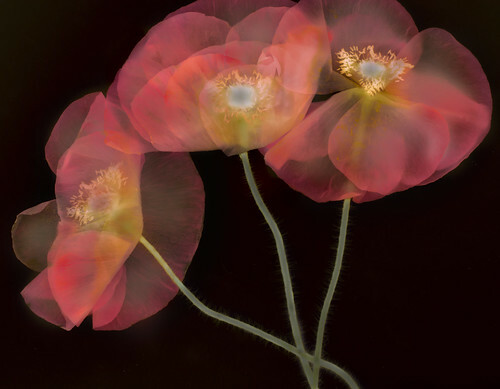 This image is an LAB inversion of the L-channel of Poppies Dancing, with blacks and white interchanged. In the traffic island in the middle of our Morning Glory Circle, as spring turns to summer the grass is drying and turning a California brown. I cut and carefully arranged a few stalks on my light box, and used LAB inversion to add a black background. Before I had left for my Camino, I started photographing grasses and “weeds”—I think this has become a whole, interesting sub-genre for me. After all, it is the wise botanical artist who knows the distinction between flower and weed is somewhat arbitrary, and in the eye of the beholder. The less-well regarded weed can often surpass in structural interest the hoity-toity flower. More images of grasses and such: Oxalis; Street Grasses; Decorative Grass; Blades of Grass; no real flowers need apply! The tip of one petal to the tail of the other. Chasing narratives. Chasing Tales. 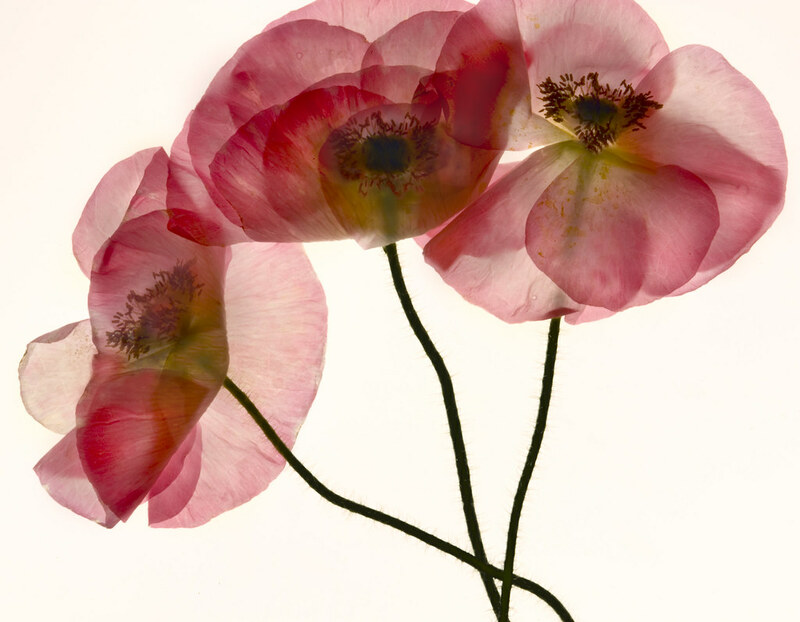 From the same petals: Studies in Petals. 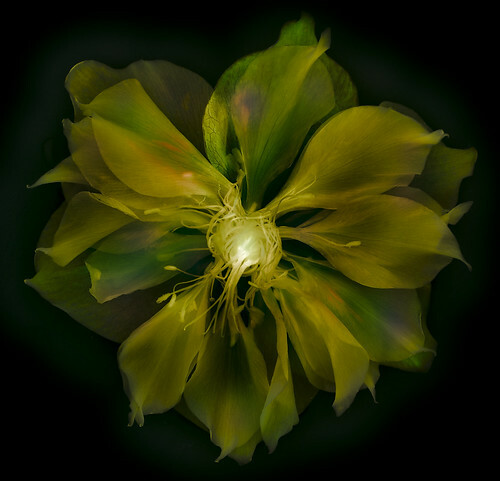 This is a mandala-shaped arrangement of petals on a light box around a central Proteus. Actually, in this case it starts with an arrangement on my light box, and eight high-key HDR exposures recombined in Photoshop. The resulting image is shown immediately below. From here, it was time to play with post-production, using rotations, horizontal and vertical reversals, a variety of Photoshop blending modes, and more LAB processing. Which variation do you like best? It started with two wonderful bunches of alstromerias (“Peruvian Lilies”), one purple and one yellow. On the alstromeria flower, the blossoms have exterior petals that are mostly solid colors (e.g., somewhat translucent, but without markings). In addition, there are usually three interior petals on each blossom that are mostly “tiger striped”—and great for transparency on the light box. You can get a good close-up look at both kinds of alstromeria petals in another of my blog stories. After we’d enjoyed the flowers for a while, I decided to use the interior, tiger-striped petals to make a pattern. My idea was to create two concentric spirals, one from the purple petals, and one from the yellow petals. This is a design that is somewhat maze-like in nature, and I have been drawing this double spiral as long as I can remember (essentially, this is a floral version of the doodle that got me through the boredom of law school many years ago!). The finished version, depending on how you look at things (and I have heard all of these by now), can be a maze, the spiral galaxy, a school of fish, human spermatozoa, a giant’s fingerprint—or even (in the school of a pipe sometimes just being a pipe! )—flower petals. With the version on white (shown at the top of this story) I thought I was done, but of course, for the wicked as for the artist, there is never any rest! No, I in truth I am not seriously wicked. Alas, as much as I might like to be a Tom Petty and the Heartbreakers “bad boy” I am probably not wicked at all. I had great fun inverting the original image in LAB color in Photoshop, creating a straight “translation” of whites to black and blacks to white (the “straight” LAB inversion is the first A Simple Twist of Fate image above). Looking at the simple inversion, I immediately I thought of Paul Klee, and color field painters such as Kenneth Noland and Larry Poons from the 1960s. This made me feel impelled to have fun with more complex LAB manipulations, shown here with a black background. As you can see, it all started with a flower petal, and ended in a simple twist of fate! 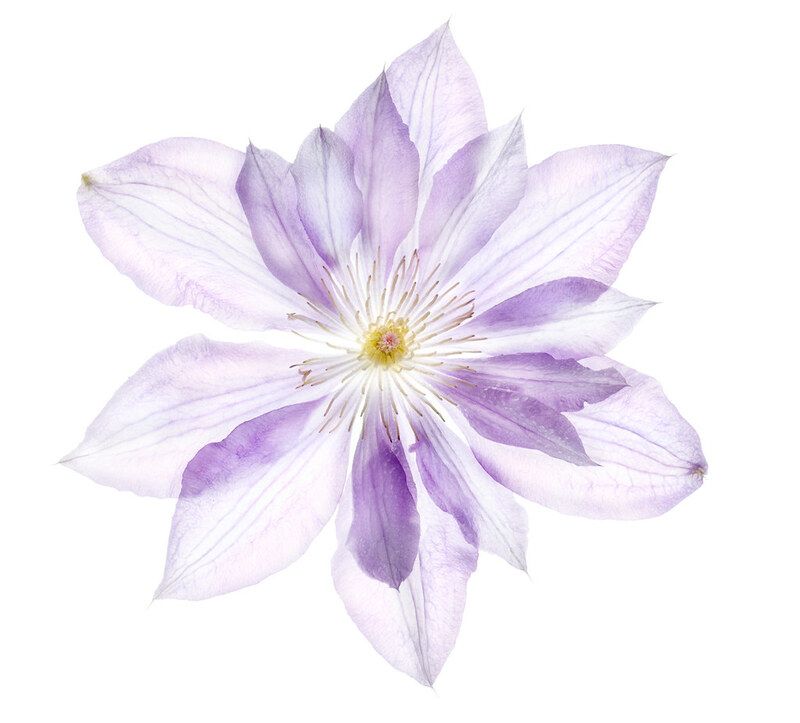 Of course, the intermediate steps required a certain delicacy in handling and “drawing” with flower petals, not to mention expertise in high-key HDR photography, Photoshop workflow, and creative uses of LAB. Which version is your favorite (and how twisted is fate?)? I am looking forward to printing these six images as an ensemble. A very special thanks (and a very deep discount) to any of my collectors (or a new collector) who would like to place an advance order for one of these prints—or, better yet, for the suite of all six prints (contact me to discuss, or if interested, for details of this offer)! From the humble Echinacea photographed for its delicate petals, the miracle of LAB channel inversions and adjustments leads straight to the drug-crazed and colorful versions you see here (just as they used to think soft drugs led to harder ones). Poppies will put them to sleep, and their little dog too! Even though the Echinacea is a simple, calming herb, and it is certainly no relative of Morpheus or his fearsome descendants. I plan to print these images as a quadtych. In other words, four images, with the original Echinacea and the three shown here. What a great word “quadtych” is! Almost as nice as “quidditch.” I often create sequences using the creative power of LAB, and these seem like a natural for printing quadtychs—and even pentaptychs and hexaptychs! On a walk around the block with the kids yesterday I saw this translucent wild ginger leaf. I snipped it, brought it home, and shot it on my lightbox. This kind of close-up photography is a very different approach to high key than something like Floral Arrangements. Close-up, this backlit leaf looks like textural fabric, a feather, or maybe a distant, colorful landscape. Almost always these days I am thinking about how images will print when I make them on our new printer, and what kind of surface or substrate will work best. I’m going to experiment with printing “Ginger”—and let you know the results! Butterfly Totem, photo by Harold Davis. View this image larger. This started as a photo of a backlit butterfly on white. 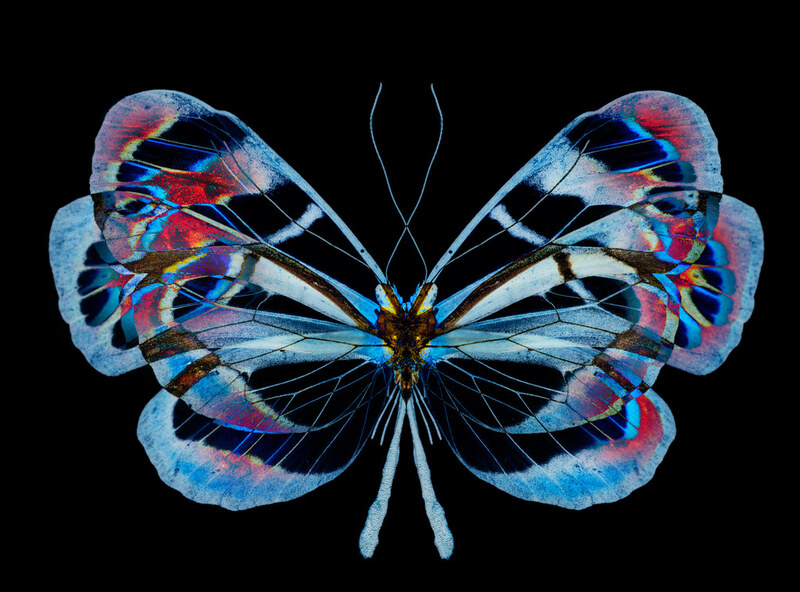 I then composited the butterfly with itself at a variety of magnifications, and used LAB inversions and equalizations. As I saw the motif of the wolf or coyote head in the middle of the butterfly emerge, I worked to enhance this aspect of the composition. Yesterday, a beautiful day with plenty of cloud cover and a strong wind, and the garden in full bloom, was perfect for indoor photography of flowers. 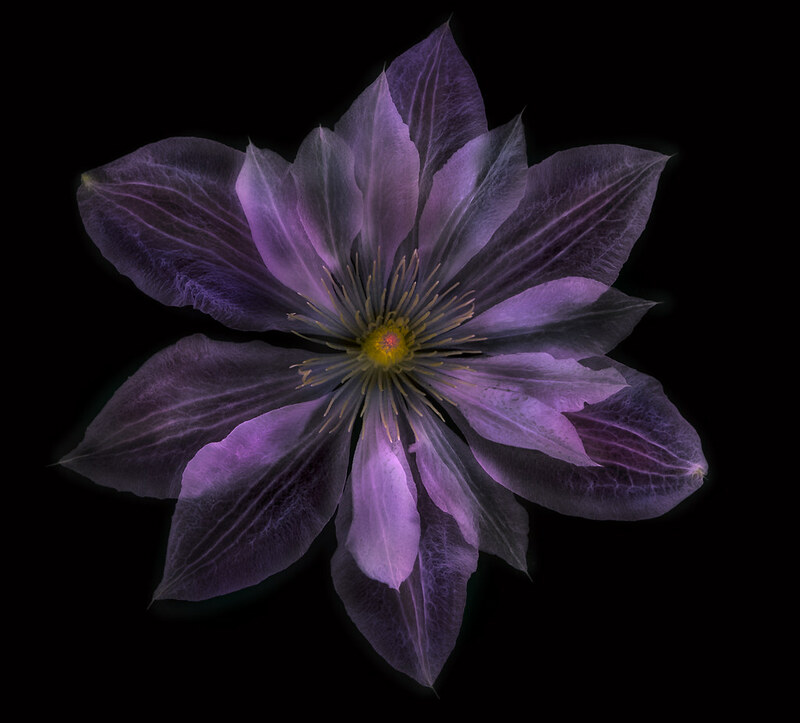 I placed this dinner-plate-sized clematis blossom on a light box for transparency, and combined six exposures. All were skewed towards high key, meaning a right-facing histogram and and over-exposure bias (according to the camera, but what does the camera know?). The clematis on white was my Annakin Skywalker, and I started the conversion process to Darth Clematis and the dark side (the image below) by converting the image to LAB color and inverting its L (Luminance) channel. From there, it was building up the dark side piece by piece through at least fifteen layers. Note: if my silly Star Wars metaphor means nothing to you, you probably don’t have kids of the right age, and may the force be with you! In my passionate embrace with Photoshop, I often don’t make as good notes as I should about exactly what steps I’m taking. That’s why I save the history log of my Photoshop moves to the metadata of each image. To set this up, open the General tab of the Photoshop Preferences dialog and make sure History Log is checked. Choose to save the log items to the image metadata (you can also save it to a text file). Finally, make sure that the Edit Log Items drop-down list is set to Detailed. Adding your Photoshop History log to your metadata will increase your file size, and it won’t tell you everything. Painting on a layer mask with the Brush tool is just listed as “Brush.” Photo metadata is often incomplete. You won’t learn from the image metadata that I combined a number of exposures (you just get the background layer). But all that said, you do a pretty good picture of the steps taken. Recently, the history log of my Photoshop moves started showing up in the EXIF data published by Flickr. If you scroll down the links, you too can read the Photoshop history log of this Clematis, and on the dark side. Speaking of Flickr, and the community of photographers and artists on the Internet generally, I find myself excited about the way I am constantly exposed to new ideas and artists through contacts on Flickr. I belive that photographers need to look at visual artists beyond photography (for more on this topic, see this interview with me). M.C. Escher has obviously influenced my composites. Lately, I’ve been exploring the work of Jacques Hnizdovsky, pointed out to me by a Flickr friend, a twentieth century artist known for his paintings and woodblock prints. Hnizdovsky’s work is intelligent, humorous, and photographic in the best sense of the word—astounding for imagery created as woodcuts. A true inspiration. Transmogrification is the process or result of changing from one appearance, state, or phase to another. Green Variation, photo by Harold Davis. View this image larger. After taking the first photo, I let the hellebore flower soak for a couple of days in a sushi dish. 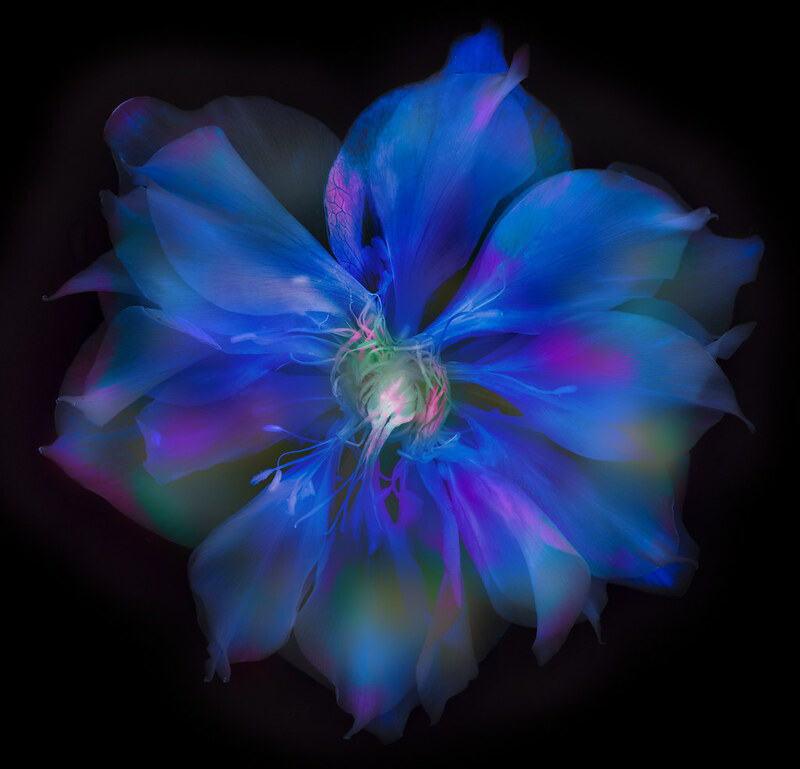 The petals became extremely transparent, and I photographed the wet ensemble on a light box. The green variation (above) and the blue variation (below) are further changes of state using Photoshop. These are LAB color space inversions with channels applied to the inversions in a variety of blending modes. The blue version strikes me as very psychedelic, almost an emphatic presence in the flower, while the green variation is more concerned with textures. In the green transmogrification, the flower has become a textile. Blue Variation, photo by Harold Davis. View this image larger. 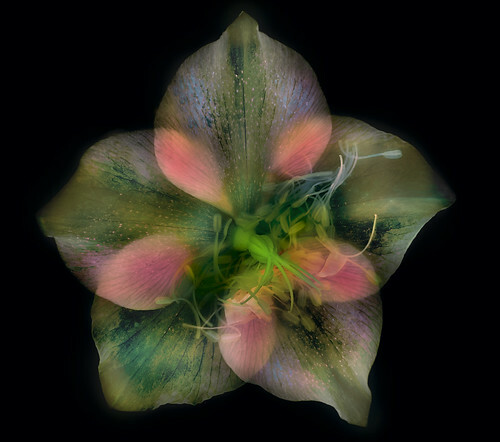 Related transmogrification: Pink Hellebore to Hidden Seeds. Further note: in the interview that Hannah Thiem conducted with me on Photo.net, we proposed a self-assignment: “Photograph a flower in a unique way—in a way that nobody’s seen before.” I think this series of photos shows that I may be working through my own assignment. Hidden Seeds, photo by Harold Davis. View this image larger. After photographing the pink Hellebore, I let it soak for several days. When the petals were transparent to the point of translucency, I photographed it straight down on a light box. 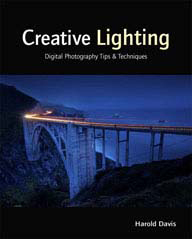 I converted the background to black in Photoshop working on the image in LAB color by inverting the L (luminance) channel. Transparency on Black, photo by Harold Davis. View this image larger. Transparency is good in many things: political processes, business contracts, lingerie, and (of course) flower petals. 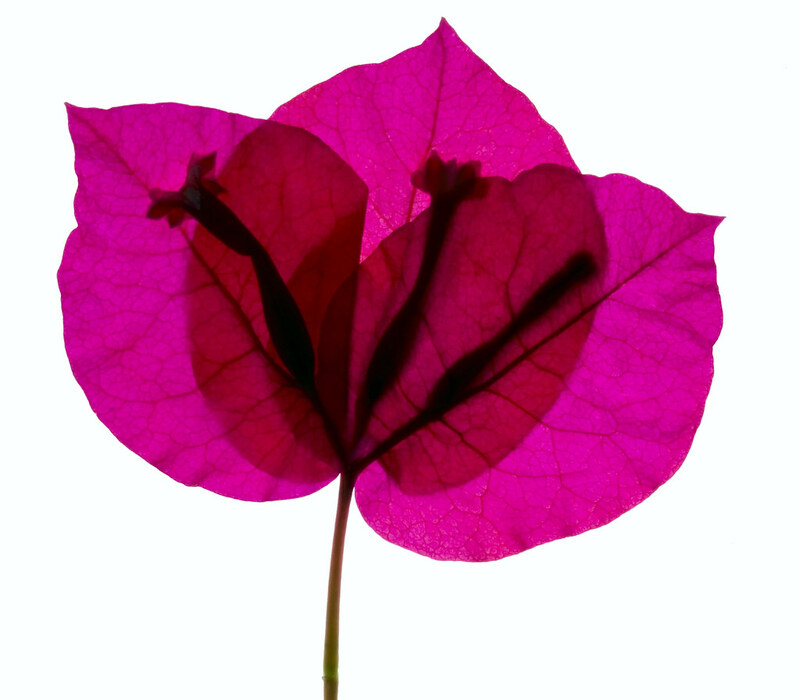 Bougainvillea Study, photo by Harold Davis. View this image larger. Briefly noted: I took a break from a writing project to work on this bright but simple study of a bougainvillea bract.